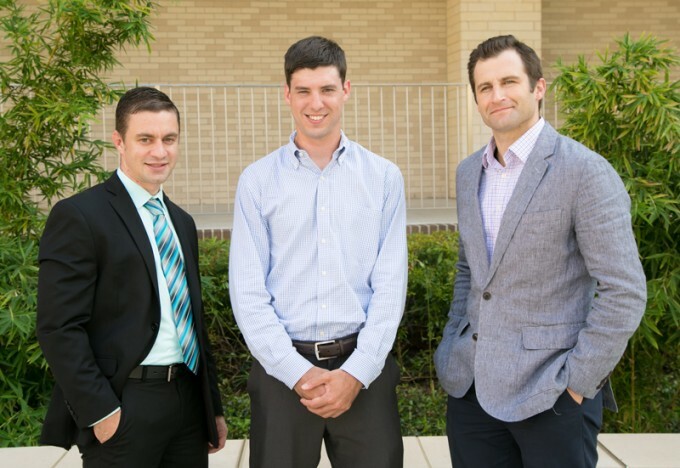 Matt Avery, Neil Gustafson and R. Jason Griffin competed with Aigul Aubakirova (not pictured) during the Google Online Marketing Challenge this summer, coming in third place in the AdWords Social Impact category. A team from the C. T. Bauer College of Business scored an impressive third-place finish in this year’s Google Online Marketing Challenge. Graduate students R. Jason Griffin, Aigul Aubakirova, Neil Gustafson and Matt Avery placed in the competition’s AdWords Social Impact Awards, which recognizes work with non-profit clients. The students partnered with Houston-based River Oaks Chamber Orchestra, which will now receive a $5,000 donation from Google. The Bauer team was one of six — three graduate and three undergraduate — in a spring semester class taught by Professor Steven Koch, who has had remarkable success coaching Bauer students in the Google Online Marketing Challenge. This year, Koch engaged University of Houston alumna Anita Perez, co-founder and vice president of operations at Houston-based internet-marketing firm TopSpot, as an adjunct professor and co-instructor. Since 2008, more than 100,000 students and professors from nearly 100 countries have participated in the competition, creating marketing campaigns for real-life clients using Google AdWords and Google+. Koch, who serves as assistant dean for Graduate & Professional Programs at Bauer, created the college’s Internet Marketing Practicum course in 2010 to prepare students for the challenge, and the results were immediate. In 2011, Bauer produced the competition’s Global Champions, beating out 4,000 teams from 60 countries. In 2013, a team from the college won the Americas Region, and there have been a host of top-three finishes in the Social Impact category. This year’s teams had three weeks and a $250 ad budget to complete their tasks. Griffin, an MBA student who led the team working with River Oaks Chamber Orchestra (ROCO), said the organization was looking to grow its online presence; generate more web activity and ticket sales; and develop its subscriber and donor base. Speaking candidly, Griffin said the team’s ads generated a modest number of clicks, not surprising since the chamber-music audience is a relatively narrow market segment. Yet a remarkable 29 percent of those views converted to actual ticket sales. Thanks to the team’s efforts, ROCO saw an 11 percent increase in revenues. Though Griffin was technically the team captain, he downplayed his role. 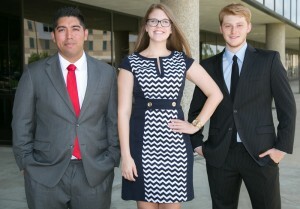 Bauer undergraduates Herbert Murcia, Brittany Young, Dylan Senter and Jordan Kunze (not pictured) partnered with the Pujols Family Foundation for its Google Online Marketing Challenge entry, which finished as a Top 10 Finalist in the Social Impact category. While his group partnered with a small organization, another Bauer team —undergraduates Dylan Senter, Brittany Young, Herbert Murcia and Jordan Kunze — specifically sought out a high-profile charity. They found that in the St. Louis-based Pujols Family Foundation, created in 2005 by professional baseball player Albert Pujols to help children with Down Syndrome and impoverished residents of his native Dominican Republic. The students helped the foundation update its website and raise awareness. They finished as a Top 10 Finalist in the Social Impact category. Good job to you guys. Taking a spot in Google Challenge is no easy feat but you did it. Kudos to the C. T. Bauer College of Business too.